Each day, a modest amount of theoretical introduction will lead to workshop sessions with opportunities to gain hands-on experience of carving wooden blades, winding coils and fitting magnets into purpose-built alternators for windpower, wiring, fabrication, erection and all aspects which can be covered as time allows. Participants who bring their own ideas and materials to the course will be welcomed and given assistance where possible. 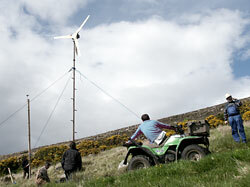 We hope to complete one wind turbine in the course of the week and make progress in the construction of others. Where participants have brought the materials, they will be able to take the complete or partially complete components (blades, alternators etc) home with them. Other work in progress will remain on site for use in future courses. For more information on his projects and on some of the books Hugh has written about windpower and small wind turbines, take a look at his website www.scoraigwind.co.uk. This is Hugh's twelfth course at Shanti Griha. Applications to . 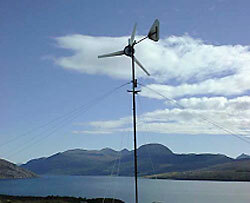 Hugh lives on Scoraig and has been working with small wind turbines since 1977. He has designed, built and sold them in sizes from three to 15 feet diameter. He understands all aspects from the aerodynamic through to the electronic theory required for small wind systems. 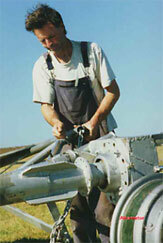 In 1995 he was hired as part of an aid project to design a wind turbine for local manufacture in Zimbabwe. The design prototype was successful and has led to a company “African Windpower” being set up to manufacture the wind turbines. Good design was essential, but equally important was Hugh’s ability to provide clear drawings and instruction, and to train personnel in Africa during his short visits to the country. More recently he has traveled to Sri Lanka and Peru, on another aid project for a different organization “Intermediate Technology.” In both countries he has successfully trained local people to build alternators for small wind turbines.